Amsterdam is one of the most popular European cities for a city break; millions of tourists and travellers flock there every year to explore everything that it has to offer. From the abundance of quirky coffee shops, stunning architectural designs and a plethora of museums and galleries, Amsterdam is world-renowned for its offering of excellent culture. Its home to the likes of the Rijksmuseum, Micropia Museum and the incredible I Amsterdam Card, which allows you to experience many of the wonderful museums in Amsterdam as part of one ticket! One of the museums that Amsterdam is most famous for is the Anne Frank Museum. What Is The Anne Frank House Famous For? What To Expect From The Anne Frank House? Is The Anne Frank House Accessible? During the Second World War, the Secret Annex inside the house was used as a hiding place for the Frank family, plus numerous other people. The Franks were a Jewish family hiding from the Nazis; their house served as a secret place with hiding places located throughout; most notably within the annex itself as well as behind bookcases and in between walls. The 'hinged bookcase' was the entrance to the Secret Annex and became the primary hiding place for the Frank family for over two years. The Anne Frank House can only be visited with the appropriately distributed online ticket for a specific date and time. It's also important to note that 80% of tickets are released up to two months in advance; with the other 20% being released on the day. Public holidays may affect the opening times of the Anne Frank House so it's important to check beforehand. The only day of the year that the house is not open is the 9th October when it is close for Yom Kippur. As deeply the sombre the experience is at the Anne Frank House, it's also wildly fascinating to explore the history and stories from one of the most famous encounters during World War 2. You can expect to see inside the main house and the annex when embarking on a tour of the Anne Frank House. There's also a dedicated 'Diary Room' that houses the original red-checked diary that Anne Frank received for her 13th birthday. It was just a few weeks after this, that the Frank family went into hiding in the Secret Annex. Throughout the Anne Frank House museum, you'll get to see an extensive collection of around 15,000 artefacts and documents relating to the Frank family and their experience during the war. Inside Anne's room, you'll get to see a collection of postcards and pictures that she's began collecting even before the family went into hiding. Some of the collections on Anne's wall was a postcard sent by her mother from England in 1937, the map of Normandy that Otto Frank used to keep track of the progress made by the allies throughout the war and pictures from magazines that were brought in by helpers during their time in hiding. The museum also shows the careful etching marks that were drawn to show Anne's and Margot's (Anne's older sister) heights. According to the markings that can be seen in the house, Anne grew 13 centimetres over the course of the two years in hiding, whereas Margot only grew one centimetre! As well as experiencing the vast collection of documents, artefacts and numerous exhibitions that the Anne Frank House has to offer, you'll also be able to enjoy a free audio tour that's provided in nine different languages. Furthermore, there's also a museum café, which boasts beautiful views over the Prinsengracht (Prince's Canal) - where you can take some of the Best Amsterdam Boat Tours - and a museum shop where you can purchase a copy of The Diary of Anne Frank, plus other memorabilia such as postcards and other publications featuring the Anne Frank story. Your tour of the entire museum can expect to last between 60 and 80 minutes, depending on how long you want to spend in each section. 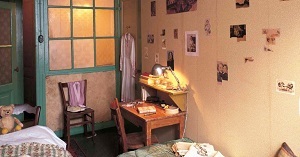 The atmosphere inside the Anne Frank House is sombre and subdued, but it'll provide you with a detailed and authentic insight into the conditions that the Frank family lived in for two years during World War II. 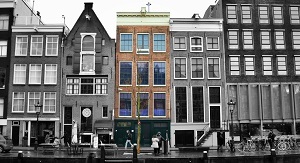 The original building housed Otto Frank's business, with it consisting of two main parts; the main house and the annex. The eight people who were in hiding in the house lived in the top floors of the Annex; you can see the Secret Annex where they hid that was guarded by a bookcase acting as a secret entrance. While inside the museum, you'll also see Anne's room which she had to share with another person in hiding. Her room is covered in old pictures and postcards that she put on her walls in order to "brighten" the place up a bit. Housed in its own room in the room, you can see Anne's original diary in which she recalled tales of what it was like living in such close confinements with so many people. There are two main exhibitions in the Anne Frank House museum; the Tangible Memories collection and Reflections on Anne Frank. The Tangible Memories collection consists of approximately 15,000 documents and artefacts, telling the story of the diary and the Secret Annex. There are dozens of photographs, diary entries, notes and school books and even drawings by the Frank family. 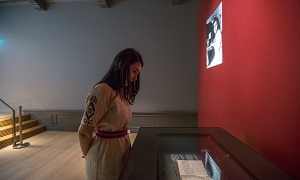 The Reflections exhibition is a continuous film that's played in the Anne Frank museum that shows various people explaining what Anne's story means to them. 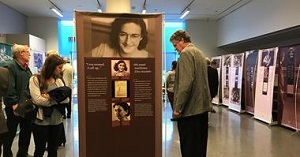 People from politicians to authors to visitors of the house have all contributed to the three large video projections, detailing what the experience means to them, as well as reflecting on the story of Anne Frank. The Anne Frank House is home to a collection of artefacts, documents, exhibitions and collections all about the suffering and experiences of the Frank family and four others who lived there with them. Its focus is on the Anne Frank Diary, which is an incredibly important piece of history that helps us to understand what life was really like in the Anne Frank House during the second World War. When visiting the Anne Frank House, it's worth booking your tickets in advance as 80% of tickets are sold out up to two months in advance. While some tickets are released on the morning of the tour, it's very difficult to get your hands on them. To avoid disappointment and long queues, make sure you book your tickets in advance. Absolutely! Skip-the-line tickets mean that you don't have to queue for hours to get inside; a bonus if the weather is poor and you don't want to stand around outside for hours! While these types of tickets are more expensive, they're worth the money if you can get inside the museum quicker! Guided tours are great way to gain an in-depth experience of the Anne Frank House. You'll learn a gain a more knowledgeable insight into the history of the museum, and you won't be confused about the different collections and exhibitions as your guide will be able to explain them to you. Plan your trip well so that you give yourself plenty of time to see everything. You should allow for at least an hour of exploration once inside the Anne Frank museum. Use the information centre and staff available. If you're not sure where an exhibition is or you want more information about the collections in the museum, make sure you make use out of the information centre and staff available throughout the House. Get the free guidebook. The information guidebook in the Anne Frank House is free and comes in nine different languages. Consider taking a guided tour. While it is possible for you to make your way around the museum by yourself, you may want to consider taking a proper tour so that you'll be provided with a deeper insight into the museum and its history. Visit the shop and café. At the shop you can pick up a copy of the Diary of Anne Frank as well as other souvenirs; the café overlooks the canal and you can grab a bite to eat while reflecting on your time in the museum. Use the Amsterdam tourist mapsto get to the Anne Frank museum without getting lost! 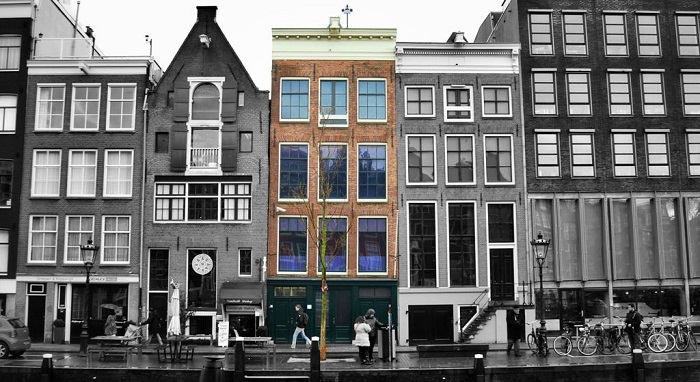 The Anne Frank House is conveniently located in the city centre of Amsterdam, right next to the Prinsengracht; you can find the entrance to the museum on Westermarkt 20. You can easily walk the 20-minute journey from Amsterdam Station, or take the number 13 or 17 tram to Westermarkt stop, where it's just a few minutes' walk to get to the house. The Anne Frank House museum is one of the most popular places to visit in the whole of Amsterdam; it's the third most visited museum after the Van Gogh and Rijksmuseum. Morning slots tend to be the busiest when it comes to the Anne Frank House; remember that 80% of tickets are sold up to two months in advance so you might not be able to be too picky when it comes to your time slot. Late afternoons tend to be slightly quieter, but only marginally. Winter months from November until March are typically quieter than high season, but you can still expect tickets to sell out incredibly quickly. Only some parts of the Anne Frank House are accessible. The house is in an old canal-side house where the stairs are very old and steep so it's not ideal for people who have trouble walking or get out of breath easily. With regards to wheelchair accessibility, only the modern parts of the museum can be accessed. The modern part of the museum includes a special entrance for wheelchair uses and provides access to the temporary exhibitions, the café and the shop. You can 'wander' around the other parts of the museum using virtual reality glasses - just ask for assistance at the information centre when you arrive. Visually impaired visitors can listen to the audio tour; unfortunately, guide dogs are not permitted inside the museum. Hearing impaired visitors to the museum can obtain a written version of the audio tour upon arrival at the museum from the information centre. While tickets for the Anne Frank House can sell out up to two months in advance, if you do manage to get your hands on them, you'll be pleased to know that they're incredibly affordable. The below shows our recommendations for the top 10 tours and tickets of the Anne Frank House. We've chosen these tours based on price, customer reviews and the best value for money. "Our guide did a great job!" "Very interesting and the guide was really passionate by the subject"
"A perfect and informative walking tour with an excellent guide"
"Outstanding tour to do in addition to the tour of the secret annex." "The Anne Frank walking tour was fantastic!!" "Excellent tour: small group; informative and personable guide"
"Great guide, informative and fun." "Nice cruise on the canal"
"It was fantastic. The staff were friendly and fun! Highly recommend"
"A great and unique way to see the city"
"Great biking tour with sights to see along the way"
"Lots of historical information and sites - Great Guide!" "It has been an amazing tour with our tour guide Tony"
"Tony did a great job, he was very informative and accommodating"
"An incredible walking tour in Amsterdam"
"Gain insight from an official local guide." "Really well-run tour from beginning to end." "This was excellent. Everyone should do this." The Anne Frank House is centrally located near the Jordaan district, along the Prinsengracht (Prince's Canal) with beautiful views over the canal. Below you can find a list of the things to do around the Anne Frank House; located near the museum. The Dutch National Museum is dedicated to the arts and history. Located just a 17-minute tram journey or a 20-minute walk from the Anne Frank House, the Rijksmuseum is a great way to spend an afternoon in Amsterdam. Take a tour through the giant former brewery in Amsterdam; with an exciting tasting room at the end of your tour. The Heineken Experience is a 30-minute walk or a 20-miunte tram ride from the Anne Frank museum. Take a 20-minute tram ride from the Anne Frank House to one of the other most visited museums in the whole of Amsterdam. Here you'll find some of the most famous works from the artist including his world-famous painting like Almond Blossom and The Potato Eaters. It's located in Museum Square in the south borough of Amsterdam and is also close to the Rijksmuseum and the Stedelijk Museum. A beautiful 47 hectares make up the Vondelpark; an urban park area consisting of stunning scenery and places to enjoy a picnic. You can get to Vondelpark from the Anne Frank House by tram, bus or foot and it makes for a perfect way to conclude an afternoon in Amsterdam. The infamous Red-Light District in Amsterdam is just 1km away from the Anne Frank House and can be easily accessed via the many bridges over the canals in the city. There are many fun museums and restaurants to enjoy in the Red-Light District; a stark contrast from the sombre atmosphere of the Anne Frank House. While in the Netherlands capital city, make use out of the Amsterdam Attractions Tickets or the Amsterdam Hop on Hop off bus tours to get around the city and explore everything it has to offer. There are also so many amazing free things to do in Amsterdam, as well as plenty of Amsterdam Day Trips to enjoy! The Anne Frank House is a must-see museum when visiting Amsterdam. You'll get to see what life was like for the Frank family during World War 2, as well as where they had to hide for over two years. If you want a truly unique experience of the city, make sure you look out for things to do in Amsterdam at night. While it is a harrowing and incredibly sad experience, the Anne Frank House opens your eyes to the horrific experiences and endeavours that many people had to go through in order to stay safe during the war.